On October 19, 2008, the third international production of the musical Tarzan opened in Hamburg, German, at the Neue Flora Theater. It was jointly produced by Walt Disney Theatrical and Stage Entertainment. The first run of the musical featured Anton Zetterholm as Tarzan and Elisabeth Hübert as Jane; the pair were the winners of the reality program Ich Tarzan, Du Jane, with producers looking for the leads of the show. The production ran for five years, and a cast album was released. Posted in Uncategorized and tagged 2000s, Broadway, Closed, International, Musical, Walt Disney Theatrical. Bookmark the permalink. On August 8, 1995, the Canadian production of the hit Broadway musical Beauty and the Beast opened at the Princess of Wales Theater in Toronto, Canada. It was one of the earliest international productions of the show, following Australia’s version in July of the same year. The original cast included Kerry Butler as Belle, Chuck Wagner as Beast, Dan R. Chameroy as Gaston, Cliff Saunders and Lefou, and Terry Doyle as Maurice. The musical ran until 1998. Posted in Uncategorized and tagged 1990s, Broadway, International, Musical, Walt Disney Theatrical. Bookmark the permalink. On May 8, 2006, the American production of Mary Poppins officially announced its leads: Ashley Brown as Mary, and Gavin Lee as Bert. Brown had previous experience with Disney Theatrical, starring in the touring show On the Record, and making her Broadway debut as Belle in Beauty and the Beast. Lee had originated the role of Bert in the West End Production, and was brought to Broadway thanks to his charming interpretation of the character. It was also announced that the official Broadway production would open November 16. Posted in Uncategorized and tagged 2000s, Actor, Announcement, Broadway, Musical, Walt Disney Theatrical. Bookmark the permalink. 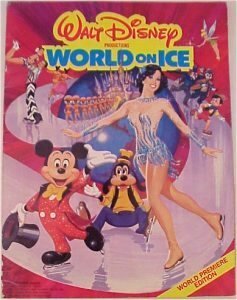 On July 14, 1981, Disney’s first edition of the ice show, World on Ice premiered in East Rutherford, New Jersey. It was and continues to be produced by Feld Entertainment, and toured 20 major cities within the United States. The show was popular enough to continue with a new theme each year, including Great Ice Odyssey in 1982, Magic Kingdom on Ice in 1983, and Happy Birthday! Donald in 1984. The themes would continue, but run for several years at a time, usually promoting a Disney film (as in the cases of Aladdin and Toy Story). In 1986, the show became international with a tour in Japan, and by 1994, the show had grown to seven productions on six continents. In 1996, the show overall show was renamed to its current moniker, Disney on Ice. The show in a part of the Disney Theatrical Group. Posted in Uncategorized and tagged 1980s, Disney on Ice, International, Touring, Walt Disney Theatrical. Bookmark the permalink.